A month ago none of the fantasy experts doubted that a tandem of Frederik Andersen and John Gibson would be talented enough to keep the Anaheim Ducks competitive in the daunting Western Conference. But it was anyone's guess as to which goalie would earn more starts and produce more fantasy value. Furthermore, when two unproven or inexperienced goalies are vying to claim a starter's job in terms of workload, a tricky pendulum effect usually takes place. Minutes earned and overall fantasy value will swing back and forth between the two depending on their performance, coaching decisions and other variables, so there's no knowing how long that will last. But with six straight wins to start the season, Andersen is proving the job is his. Behind this red-hot start, the native of Denmark has 26 wins in his first 31 decisions (26-5-0), which is a new NHL record, according to the Elias Sports Bureau. In those 31 regular-season starts Andersen has allowed more than three goals only three times. All three times he allowed four goals in each game (12 goals on 90 shots). Playing with that level of consistency this early in his career, he led last season's rookie goaltenders in vital fantasy categories, including wins (20), goals-against average (2.29), and save percentage (.923). Andersen also is 13-1-0 when facing 30 or more shots in a game, another sign of his reliability and consistency so far in his NHL career. In terms of even-strength save percentage, which is one of the most commonly used categories in comparative goalie analyses, Andersen's .932 career mark is admirable for a goalie that soon will break the 2,000-minute barrier in the NHL. This also includes a .952 save percentage at 5-on-5 play this season. You also can't look past another key situation: the penalty kill. Since the 2011 season, for goalies that have played between 20 and 70 games, Andersen's .912 power-play save percentage trails Cam Talbot, Alex Stalock, Anton Khudobin, and Robin Lehner. If you think Andersen merely is a product of a strong team in front of him -- and there is merit to that debate because of his smaller sample size -- this season he's backstopping a team that has a 48.7 Corsi-for percentage, which is 22nd in the League. Anaheim also is a middle-of-the-pack team in terms of shot suppression, allowing 27.6 shots per game. We've also been keeping track of back-to-back goalie stats, and in 28 tail-end games this season, Andersen is the only goalie to earn two wins in consecutive days. When he was drafted by the Carolina Hurricanes in 2010 (No. 187), Andersen was tipping the scale at nearly 250 pounds. His weight was a concern for a few years, but now that he's down to 236 pounds, his mobility and edgework have transformed into strengths in his game. More importantly for the Ducks, Andersen's play means they no longer have to rush Gibson into a role he may not yet be ready to handle. Despite Andersen's play, we stress patience with Gibson. His second start likely will come next Thursday or Friday when Anaheim visits the St. Louis Blues and Dallas Stars in a back-to-back situation. But with one game under his belt so far, don't expect coach Bruce Boudreau suddenly to start pulling minutes away from Andersen, who has tons of momentum, confidence, and rhythm. 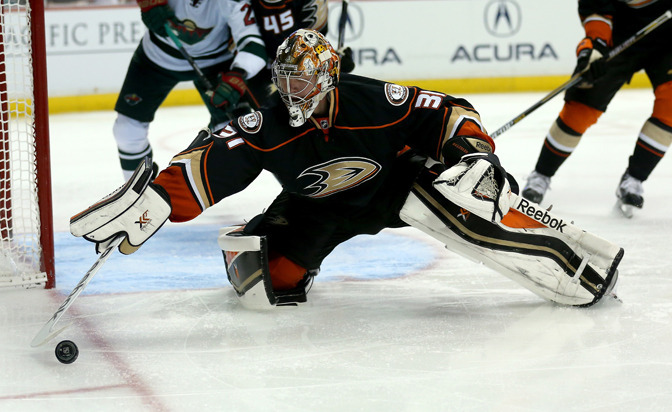 It's still early, but if Andersen stays consistent he could earn 60 to 70 percent of Anaheim's starts. Considering he was drafted, on average, No. 136 in Yahoo fantasy leagues, he's clearly the early candidate for the most profitable and underestimated goalie selection this season. It was only fair to downgrade Rinne in fantasy drafts because of last season's major hip issues. But those concerns are dissolving thanks to a 4-0-1 start, which includes a 31-save shutout against the Winnipeg Jets. He has stopped 125 of 133 shots this season, a .940 save percentage. The starting role in New Jersey was placed in front of Schneider on a silver platter, but his play through two weeks has been too sloppy. With 12 goals-against in his past three games (0-2-1), he has an .898 save percentage. He has faced 30-plus shots in a game twice. With wins in his first two starts, Lehner continues to prove he's a future elite starter. Both wins included 38-save efforts, giving him a .950 save percentage in October. Lehner is unbeaten in regulation in his past eight games, going 7-0-1 and making 292 saves on 309 shots, a .945 save percentage. These modified re-rankings are a projection of a goalie's fantasy output for the entire season. Our rankings are based on volume categories like games played, wins, saves, goals-against average (GAA) and save percentage (SV%). The plus or minus for each player is movement based on our most recent rankings from last week (NR means not ranked in previous rankings). It is important to note that our rankings reflect sheer fantasy value, not talent. A less-talented goalie could be ranked higher due to their team’s strong defense and offense.